I hope this the right forum. A video that was on my daughter's cell phone (Samsung Galaxy S4) was deleted that video is evidence in a possible lawsuit. Is there a way to retrieve it? I long ago was it? It could still be recovered, if it was deleted fairly recently. First port of call is to use Recuva by Piriform, you can get it here. It will begin scanning, and will give you what it found. It will analyze the damage and corruption of this file, and will check that it's still recoverable. This scan may take a while to complete, especially if you have a lot of files on the device. Edited by Caliburn, 19 May 2015 - 11:03 AM. Thanks for your reply. I downloaded recuva and connected the phone. The phone doesn't show up as a separate drive and the one file it partially recovered I'm sure isn't the right one based on the date it says was modified plus I can't view it. I'm not sure what to say then. How long ago was the file created? I'm sure the retrieved file is from the pc and not the phone. The video on the phone was created on May 16 and no new pics or video taken since then. For some reason the phone won't show as a separate drive when connected to the pc. Navigate to "Settings" on your phone. Go to the section "Storage"
After that, see if it appears as a drive. I got to the USB connection but it still doesn't show a drive for the phone. I may just try a commercial outfit. That is probably the best option at this point, unfortunately. Sorry I couldn't be of much help. [bleep] i can recover my deleted videos in my s4 then. This post is so helpful i have the same problem with you dude. I hope the steps you given will work on my s4. Recuva doesn't work at all. It only scans the existing files on the phone. After a few days researching, found out the common problem for failure is that the phone should be rooted if you used third-party recovery programs. I fortunately downloaded a right one called TunesBro and here is a detailed post on how to recover deleted videos on Galaxy S5/S6. Hope this helps. 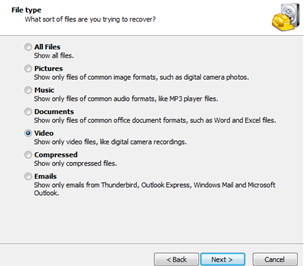 Before using other data recovery methods, you should check out your backup first, have you synced your phone ? If you don't have backups of the lost files, you can try data recovery tools to recover deleted videos from samsung and other data. Edited by relliee, 12 March 2017 - 08:16 PM. If your deleted video has not been covered by new files,Samsung data recovery can help you get them back. When you deleted video,they were first moved to trash bin and became invisable.Actually,they still exsit on your device until you add new files to cover them,data recover tool can access them.